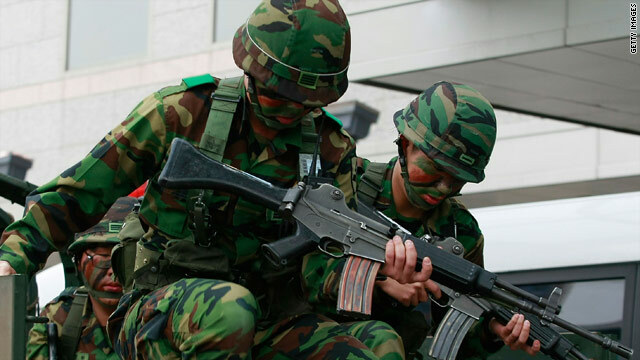 South Korean soldiers participate in a drill against possible threats from North Korea in Seoul on May 28. (CNN) -- Chinese Premier Wen Jiabao said Sunday that Northeast Asia -- which includes the Korean Peninsula -- must push for peace and avoid violent clashes in the aftermath of the sinking of a South Korean warship, state news reported. "We must promote peace and stability in the Northeast Asian region through every effort," Wen said, according to South Korea's Yonhap news agency. "We should be considerate of each other on a grave issue, deal reasonably with a sensitive matter and strengthen political trust." His comments to reporters came after two days of meetings with South Korean President Lee Myung-bak and Japanese Prime Minister Yukio Hatoyama on the South Korean island of Jeju. The summit came amid mounting regional tension, but was scheduled before the release of a report accusing North Korea of firing a torpedo that sank the Cheonan warship, killing 46 sailors. Lee has said that his government planned to bring the issue before the U.N. Security Council. But any attempts to seek penalties against North Korea there would need the cooperation of China -- which has veto power on the council. Wen did not mention North Korea directly in his remarks Sunday, Yonhap reported, despite political pressure from South Korea to take a stand. And during talks with Lee in Seoul, South Korea, on Friday, he said that China had not decided whether to accept the results of South Korea's investigation into the ship's sinking, South Korean officials said. During Sunday's press briefing, according to Yonhap, Hatoyama said the leaders shared a common view that the Cheonan's sinking was a "serious issue related with Northeast Asia's peace and stability." Lee said Sunday that he had agreed with Wen and Hatoyama to "cope appropriately with the matter and continue consultations to maintain regional peace and stability," Yonhap said. The leaders discussed a wide of regional economic and political issues during the two-day summit, including trade and nuclear disarmament. "We share the view that denuclearized Korean Peninsula would greatly contribute to enduring peace, security and economic prosperity in Northeast Asia," they said in a joint statement.